Where will GBP EUR be one year from now? Are we likely to hit parity? While sterling has made gains since its early year lows against the dollar, it has remained under the pump against the single currency this year and, at the time of writing, was near a seven year low as investors continue to express their displeasure about Brexit and the progress of the negotiations. Such is the speed of the descent and the low levels that we are currently trading at – since the inception of the single currency, sterling has traded at an average of 1.36 against the euro – that the question arises about parity, a level that we have never hit (the closest was 1.02 in December 2008). Brexit represents a Pandora’s Box of uncertainty for investors whilst European politics have appeared calm given the defeat of far right parties in the Netherlands and France. Issues in European politics remain of course – not least the German elections, upcoming polls in Italy and the issue of another Greek bailout – but the generalised improvement in data within the Eurozone and the subsequent softening of language at the European Central Bank (ECB) about relaxing negative interest rates and halting its quantitative easing program have helped speculators look past political news. Our view is that GBP is likely to consolidate against the European single currency in the short term. That said, there are lots of reasons why sterling can fall further from here, not least the expected continuation of weak economic data in the UK as businesses wait for some clarity on what relationship they will be forced/able to have with the UK’s largest customer. Once again, the survey of 84 economists and strategists put together by Bloomberg shows that the median estimate is for GBPEUR to remain around 1.12 through the coming year. We do think that the euro is overbought at current levels but as we all know, markets can remain irrational longer than one can remain patient. What happens to the euro if Angela Merkel loses the German election? A Merkel defeat is not something that anyone is talking about at the moment and therefore would constitute an awesome surprise to the geopolitical landscape. She has been Chancellor through the terms of 3 US Presidents, 4 French Presidents, 4 British Prime Ministers, 5 Greek Prime Ministers and 6 Italian Prime Ministers. She is a political force of nature and her defeat would herald a very difficult time for the European Union as a whole. That said, the SPD candidate and her main challenger is very much a centrist and while the euro would likely weaken on a hint of uncertainty, it would hardly give it a body blow. Our view is that the threat to Angela Merkel is rather overstated; her lead in the opinion polls is a very stable 10 points and unlike the recent election in the UK, she is a known and liked candidate. That is not to say that there are not risks. Policy gaffes are ten a penny in the heat and noise of a political campaign and there is always a risk from something totally unexpected, like an act of terrorism, a hacking attempt or Russian interference to rock the apfel cart. Much like in France and the Netherlands there is a question that needs to be answered about the progress of right-wing populist politics. Both the PVV in the Netherlands and Front National in France were defeated handily and we fully expect that the broadly similar Alternative für Deutschland party will achieve little more than grab some headlines and maybe a few seats in the Bundestag. Conclusion: While we think Merkel’s CDU/CSU coalition will win out in the end – on the basis of a ‘steady hand’ amidst issues of a continued Eurozone crisis, Brexit and growing Russian influence – it will be the themes within the campaign that govern the euro fallout. Would a rise in interest rates by the Bank of England help the pound? With Brexit negotiations rumbling on in the background and the UK parliament in its summer recess, the main conversation around the pound has been about interest rate rises. The catalyst for this has been a run of inflation above the Bank of England’s target of 2%. This has been driven by the fall in the pound following the vote last year to leave the EU. As the value of sterling fell, and given our trade position as a net importer, it was only a matter of time until the cost of those imports began to increase. We do not believe a rate hike is due anytime soon in the UK. The most recent Quarterly Inflation Report press conference saw Deputy Governor Ben Broadbent opine that the “maximum rate of pain” for consumers was soon at an end. 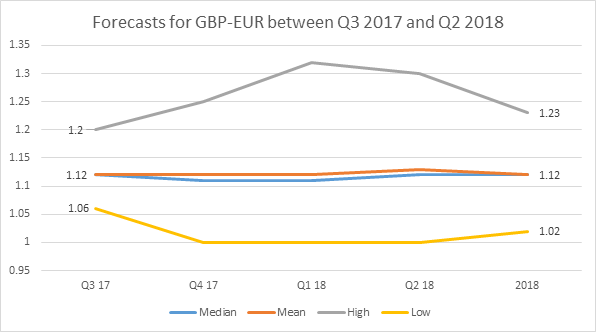 This directly feeds into the belief that as we move further past the anniversary of the UK’s decision to leave the European Union the base effect on UK price levels will diminish and year on year inflation will calm. Of course the “pain” to which Broadbent refers is not just as a result of a pickup in prices but a slowing of wage growth as well and while the Bank of England may be confident that inflation may become more benign there is less commitment to a belief that pay will start to charge higher. A run higher in inflation above 3% could make some members of the Monetary Policy Committee plump to increase borrowing costs, especially should sterling decline even further than its current levels. There is also the fringe belief that a rate hike is necessary to undo the post-Brexit decision to cut rates as, for now, a recession has been avoided. Conclusion: We doubt just how much long term sterling support a rate hike would provide in the case of higher inflation. The US Federal Reserve has hiked rates three times in the past eight months and the USD is down over that time period, so while chatter of a hike may provide a boost, sometimes a higher interest rate can easily be forgotten about in a volatile political environment. How long will the Brexit negotiations last? How long is a piece of string? At the time of writing it is a little over four months since the triggering of Article 50 and we are, on the face of it, nowhere close to agreement on the litany of issues that Brexit represents. With four months gone, according to the rules 20 remain, and unless we have a transitional agreement in place then the UK will be out on its ear and outside of the European Union. Article 50 and the two year time frame was originally set almost as an afterthought; a week may be a long time in politics but two years is a blink of an eye in international relations. Access to the single market, the customs union, freedom of movement and investment as well as trade taxes and subsidies are just a few of the behemoth pieces of legislation that the UK must disentangle itself from in order to reintegrate itself eventually. Recent movement in Westminster suggests that the knowledge that a transitional arrangement is necessary is starting to gain traction. There is no word yet as to how long this will last but initial estimates suggest it could be anywhere between an additional 2 and 8 years of negotiations. Leave voters are unlikely to be happy to sit and wait for an additional 8 years to finally get shot of the EU and so any additional, transitional time period is likely to be short but once again with the option to extend. Conclusion: The long and short of it is that nobody knows. However, we think it is still very possible that the UK will still technically be a member of the European Union by the time of the next General Election in 2022.